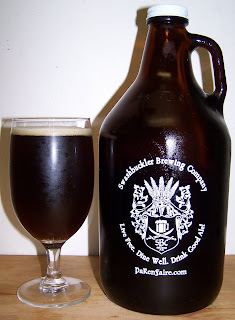 This week’s grower from the Swashbuckler Brewery at PaRenfaire is their Skull Annihilator. This is their Doppelbock. I’m really looking forward to his since I didn’t get a grower last week. Pours a dark brown, almost completely opaque with amber hues and an off white head. There is some toasted malt aromas on the nose. There is also a bitterness that manifests itself with just a gentle swirl of the glass. This does not seem to be a hop bitterness but more of a robust malt aroma. This is a pretty heavy bodied malty beer. There is a rich toasted malt sweetness up front then a nice frying effect and the final taste is a nice but robust toasted malt flavor with an almost creamy mouthfeel. There is a somewhat lingering malt taste but it is not as strong as a stout would be. This is pretty good even as it warms up. It is now 68 degrees and it’s still impressively good; smooth and rich with a toasted malt goodness. That one was so good I’m going to have anther as I work on my final thoughts. The second was actually better then the first. This is an impressive Doppelbock. Aside from the Saison this may be the best beer I’ve had from Swashbuckler. I have purposely let this second beer go; it has been sitting or while and it is now at 74 degrees, so let’s see what this beer is make of. Wow, that’s just amazing. This beer just keeps getting better as it warms up. There is no carbonation left in it so you would expect a malty beer like this to get syrupy but it didn’t. It maintains this smooth creamy malty taste that is very enjoyable. Now I realize that these are extreme temperatures but I am so impressed when a beer not only holds up to this test but it surpassed my expectations. This beer did not pick up any unpleasantness even up to 74 degrees. Now That’s A Beer! OK, it’s not as good as the Ayinger Celebrator but it is a very good to excellent Doppelbock, somewhere around a B+ for the Swashbuckler Doppelbock. Man, some people have all the luck! I am finishing a Flying Dog Gonzo Porter. It's as you suggested. It is an Imperial Porter and claims 7.8% ABV...also a IBU of 85. You can taste the hops, sometimes as a bitter after taste, but not all the time. It actually seems to get better as it warms. Great recommendation! That’s great Ken, I'm glad you liked it. The Gonzo porter is on my review list for this fall/winter. I’ll have to see what else Flying Dog has that you may like. I will be going to another Flying Dog tasting but it’s not until Dec. 4. I’ll keep you posted.